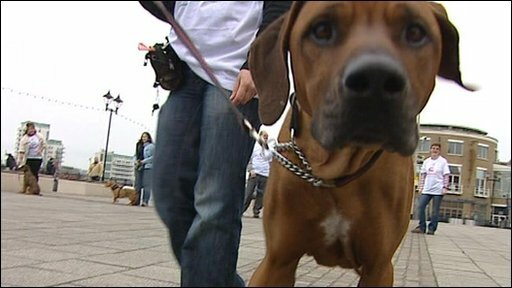 Wales has become the first part of the UK to outlaw the use of electric shock collars to train cats and dogs. The ban, passed by assembly members, means from midnight anyone caught using the devices faces a fine of up to £20,000 or six months in prison. Animal welfare groups such as the RSPCA and the Kennel Club supported the move. The Electronic Collar Manufacturers' Association said it feared the ban could lead to an influx of unmanageable pets into dog shelters. The collars are sometimes used to train dogs and cats by giving an electric shock when the animal is deemed to have behaved badly. 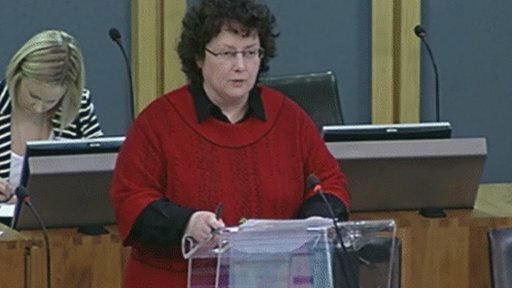 Wales' Rural Affairs Minister Elin Jones, who announced plans for the ban last month, said she was "very pleased". "It is important that owners are aware of the ban, and that they now take appropriate steps to comply with the law," she added. "I'm pleased that as a government, we are taking a proactive approach to promoting the welfare of animals by banning the use of such electronic training devices in Wales." The RSPCA said it believed there was no place for shock collars in modern animal training and recommended the use of reward-based methods instead. Kennel Club members staged a display of support outside the Senedd in Cardiff Bay before the vote. Its communications director Caroline Kisko said: "This is a historic day for animal welfare in Wales and we are absolutely delighted that so many AMs voted in favour of the regulations. "Today, Wales has proven that it is truly leading the way and we hope that the rest of the UK will follow by example to outlaw these cruel and unnecessary devices." But manufacturers said the devices helped to successfully train dogs not to chase livestock, or attack other pets or people. Duncan McNair, of the Electronic Collar Manufacturers' Association, said: "It's a bad idea because more dogs will die, more dogs will have to be re-homed and more owners will have to be distressed at having to give up their pets." He said there were around 500,000 of the collars in the UK and said, at a rough estimate, there were around 20,000 in Wales. "I wouldn't dream of suggesting that people disobey the law, everybody will be making their own decision about what they do, but what I do think is that if a large number of people who use them stop using them, there will be an influx of dogs into dog shelters."